Best place for sushi by far! 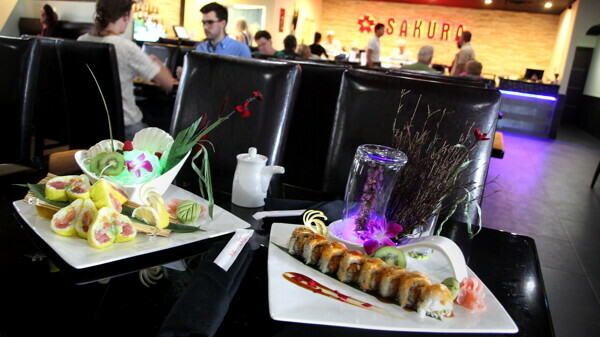 The owners are amazing and very willing to please your sushi expectations. Friends staff. AMAZING seafood, tastes so fresh compared to other restaurants sushi options. Creative sushi chefs. Willing to accomodate allergens, picky eaters, etc! Favorite restaurant . the food is awesome , love the shrimp tempura rolls very tasty better than fuiji !! I stopped in for lunch and was immediately impressed upon walking in. The place looked awesome, the staff was well dressed and professional. And the food was great! I ordered a lunch bento box which was served in less than ten minutes and looked awesome. I'll definitely return and will recommend to others. I have eaten here twice for lunch and once for dinner. It did not disappoint!! I enjoyed the atmosphere and ambiance of the set up. Staff were friendly and helpful. My new favorite place for Japenese!